The new site helps local clubs customize their online experience. Planet Fitness is exercising a revamped website strategy to encourage sign-ups from all those folks who resolved to get in shape for 2018. The workout club chain was founded in 1992 in Dover, NH, with a mission of bringing fitness to the masses, with $10 a month membership. Today, the company has over 10 million active members in 1,400 locations. The company’s old website was last revised in early 2014, with the primary purpose to acquire U.S. members, and limited engagement opportunities, noted Chris Lavoie, vice president of information systems, Planet Fitness. Today, with over 75 percent of traffic coming from mobile devices, the need for a responsive site and localization was imperative. The new site, created with the help of Acquia, is still very transaction and acquisition focused, says Kate King, digital marketing manager. But the company also wanted to infuse more brand energy into the new site, and ensure that it wouldn’t be quickly outdated. A focus on local club pages, as well as creating ways to educate new members with rich, self service content was one of the main goals. Today, each club has a club page on the site that can be customize to local needs and interests. “The old site was very cookie cutter and we wanted to fix that going forward to engage members,” she says, noting that the ability to join needs to be frictionless. Making sure that branding and messaging aligned across all digital touchpoints was also crucial. A Drupal 8 content management system allowed the company to build a non-transactional content section to boost community across the site. “It’s critical to franchisees that they have control over things like their Facebook pages, so they present offers and messaging that will resonate with their markets,” says King, who spoke at Acquia Engage. 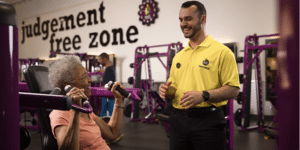 From member feedback, Planet Fitness found that members were interested in community online, and wanted content related to topics like health, such as recipes and workout tips, rather than just content related to transactions. The success of the new Planet Fitness site is judged by new membership conversions and membership upgrades, as well as SEO traffic from non-branded keywords, social sharing and traffic from existing members.